As I Explained earlier, the next 18th June at New York will take place the Futbol Artist Exhibition with 25 great artists. Steve WELSH, one of them, makes sensation before this exhibition with his Alexi LALAS's work. As you know now, Steve accepted a few weeks ago to participate at a Old School Panini's project but it's still a secret and this is not the today's subject. For the moment Steve with Daniel NYARI and Sebastian DOMENECH are the new stars of the Big Apple and as Steve is a friend he accepted for Old School Panini to answer some questions of this exhibition and the following events with Alexi LALAS. Now we will see the artist behind the scenes. How did you learn that you would participate at the Futbol Artist Exhibition in New York ? 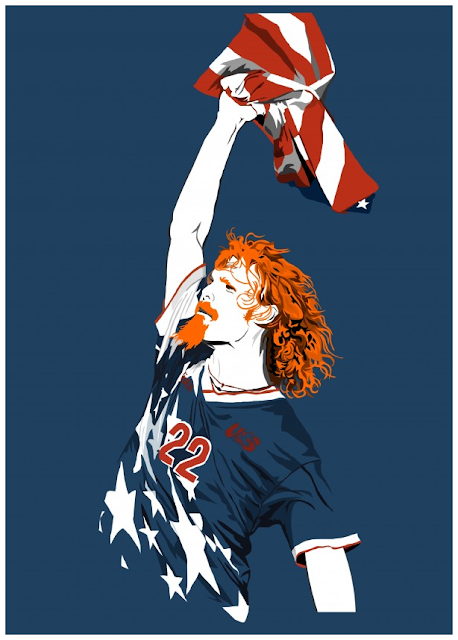 Then I think you draw Alexi Lalas especially for this event is that right? That's right, each of the artists was given 'carte blanche' in terms of which subject matter they chose. Knowing the exhibition was to take place in the US I felt sure Alexi would be a popular choice. 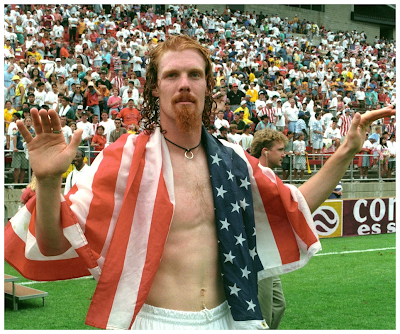 Alexi Lalas was your first choice ? Why you choose him and Why this picture ? 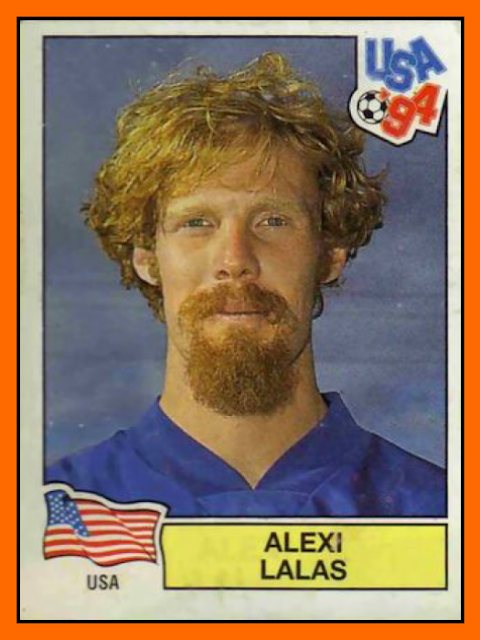 When you think of football / soccer in the US, Alexi is probably the first name that springs to mind. An iconic player with equally iconic hair (something I think works well for cult players e.g. 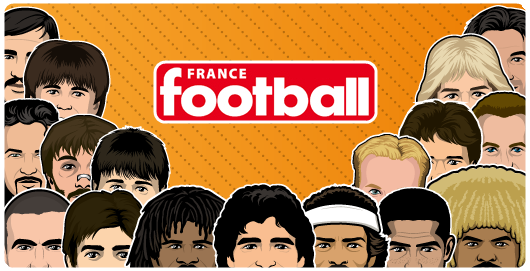 Valderrama, Baggio, Gullit etc). The denim kit was something I knew I wanted to include, particularly because it often polarized opinion, which is something I think Alexi did as a player too so it seemed a good match. 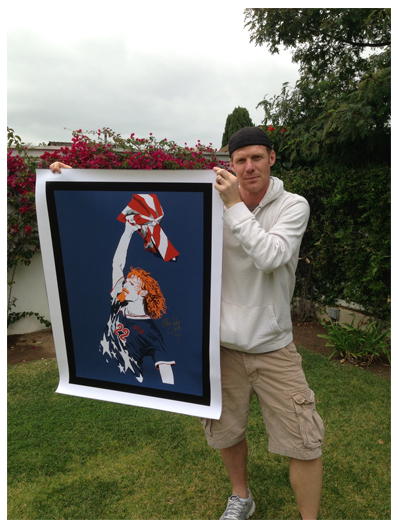 What do you feel when you see these two pictures with Alexi LALAS and your work ? I was fortunate enough to attend the 1994 World Cup Finals and watched Alexi play in the USA vs Brazil game on July 4th. 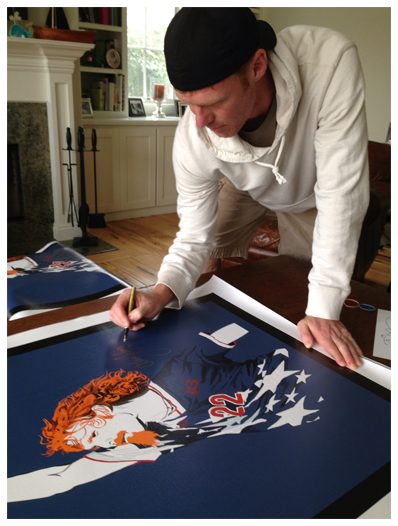 So to have him sign limited editions of my artwork 19 years later has been an incredibly surreal experience. I feel very proud to have had my work endorsed by such a key figure.